This is a moderate trip taking us through some of the most scenic parts of the center of the Park. Big Sycamore Canyon with its large trees, Serrano Canyon with dense foliage, an open field, a ridge, and a large expanse of chaparral present a variety of plant forms. We reach the trailhead by driving 20 miles west of the Malibu Canyon Road on the Pacific Coast Hwy to Sycamore Canyon. Park at the day parking lot on the left after passing the kiosk. Walk through the campground and upstream on the Big Sycamore Canyon Trail. A mile and a half after leaving the campground we will pass the Serrano Canyon Trail on the right. That will be the trail that we will come down later. Continue up the gently graded Sycamore Canyon occasionally crossing the stream. This part of the canyon is wide, and is typical of this outstanding sycamore savannah. We will see deep grass under spreading trees. Keep our eyes open to see deer tracks and on occasion a deer. Look up to see a couple of acorn woodpeckers sitting on Sycamore branches making short flights if you walk up close. Maybe a ground squirrel will run across a log. This natural activity makes this eco-system a vibrant, live and interesting place to visit. One hour after leaving the trailhead we will be near the Wood Canyon Trail junction. Several trails branch out from the main trail in this area; the one that we will be taking is on the right and is a trail, not a road. Our first view of this trail is shocking after the previous level walking. The trail goes up a steep ridge relentlessly gaining 800 feet before reaching a level area near Old Boney Road. We feel some consolation in the spectacular view of Sycamore Canyon. Once on the ridge dividing Sycamore and Serrano Canyons, the view opens up considerably. We see the grasslands of Serrano to the southeast and Boney Mountain with its many peaks jutting out to the east. A chaparral plant community dominates the ridge and the slope to the north. We will notice a new trail heading east and uphill. For this hike we can make a decision to temporarily turn left and after a few switchbacks and some gain we can see a split rock that tempts us to walk through. With encouragement we can be convinced that "demons" do not follow a person through a split rock. Turn around at this spot and even though we go back to the trail we were on we will go downhill the rest of the hike. 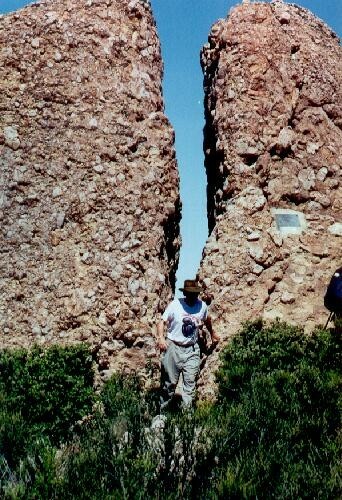 We may add a mile to the hike but it is an unusual split rock. Take the trail south downhill into Serrano Valley. This road drops 350', then makes a left turn around a shoulder and goes across an intermittent stream coming down from a prominent rock waterfall. After crossing the stream and making a right turn, the road climbs for a few minutes, leveling off on the shoulder of a grassy ridge that slopes to the south. Walk south on the ridge. Grass grows in the spring, hiding the trail so we watch for a turn to the right. Head for a prominent Sumac tree. Look for the trail to the right of the tree. Nevertheless, do not be concerned if we can't find it -- we'll just continue south on the highest part of the downhill sloping ridge. When the ridge levels out, the trail angles to the right and meets the trail that goes down Serrano Canyon. An old fence line divides the grassland from the chaparral. It is near the fence line that we can pick up the well-defined trail into the canyon. The trail goes through some chaparral, then very quickly enters the canyon environment of shaded trails, pools of cool water, and luxuriant vegetation. Serrano Canyon is a steep-walled, solid rock, water formed gorge, connecting the higher Serrano Valley with the Sycamore Canyon downstream. The footing is good in most places. Some stream crossings might present a problem, depending upon the level of the water. Some low hanging branches can be hazardous, and keep a lookout for Poison Oak. 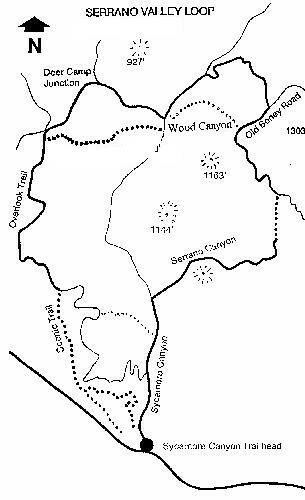 Upon reaching the Big Sycamore Canyon Trail, turn left and return to the trailhead.